Red Sox on verge of reversing vision? So much for paying less for under-30 players? Not so long ago the Red Sox were rather smug with their new innovative stance to the free agent market. As John Henry was quoted in Bloomberg Businessweek last season, "Virtually all of the underpaid players are under 30 and virtually all the overpaid players are over 30," Henry said. "Yet teams continue to extravagantly overpay for players above the age of 30." Yet here we are on the edge of some attempts to make big moves targeting exactly these types of free agents. Can we assume the dream of competing for post season fame with a crop of cheap and inexperienced talent did not pan out and the Red Sox front office is now put this position out to pasture? Do we smell a slight whiff of desperation in the runs being made at players like Pablo Sandoval, Jon Lester and Andrew Miller? First off, the Red Sox courted Sandoval over the course of 3 days last week. 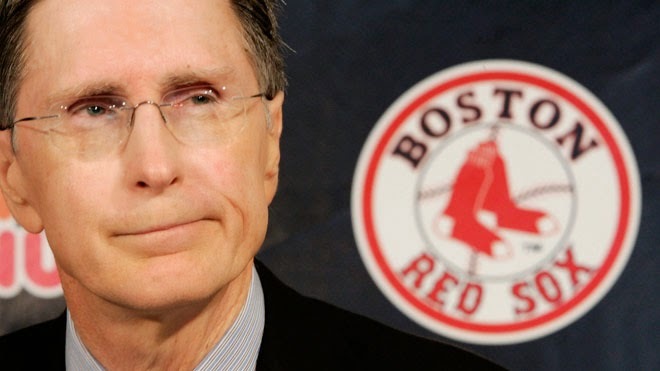 The Boston Globe reported Friday that the Red Sox have extended a five-year, $95 million offer. Other teams interested in Sandoval's services include the San Diego Padres, Toronto Blue Jays and the Giants. The highly sought after third baseman is expected to make a decision about his baseball future this week, according to his brother and co-agent. He will turn 29 years old in 2015 season and the Red Sox reversal in strategy has them attempting to secure him through to age 34. Enter case number two, Jon Lester. On Lester their core principles have been clear, giving huge money to players in their 30's, particularly pitchers, is a disaster waiting to happen. Enter the negotiations where the Red Sox made him a substantial offer. Terms of the offer were not disclosed, but the Boston Globe, citing someone from in the room, reported that the Red Sox pitched a six-year deal in the range of $110-120 million. If the Red Sox can reunite with Lester, expect tickets at Fenway to be in high demand again. You can check out some great deals here on 2015 individual games. Unfortunately, that's probably not going to get it done. There are other teams in the mix, notably the Cubs who want Lester and missed out on Russell Martin already, leaving them is a large cash pile to push into the Lester deal. The Red Sox will really have to up this offer to compete as the Jays Journal reported that Bob McCown stated that the Blue Jays are "...talking 7 years" and he goes on to guess a dollar amount of $140-$150M. Assuming the Red Sox make this trade happen at the current offer or by bumping this offer up, they will be paying for Lester to pitch into his 36 or 37th year. Another reversal of company policy. Enter the final specimen, Andrew Miller, who the Red Sox are "very serious" about pursuing this off season. It is reported that he has multiple 3 year deals already on the table after 22 teams have called his agent this off season. The reality is that he will command a 4 year deal and if the Red Sox pull him into their bullpen as he turns 30 years old, they will end up again rewarding a pitcher into his 34th year. Without a doubt the Red Sox have stopped all that nonsense around paying less for more, as the sting of going from World Series winners in 2013 to complete and utter failure in 2014 is still very fresh in their minds. Wonder what John Henry's new quote will be for the 2015 season when the dust settles around these three free agents, all going into 30+ years of age and looking to reap major long term deals?